Until completing a doctoral program in 1973. For my doctorate at the University of al-Azhar University, Cairo, he wrote a dissertation entitled "Zakat and its Impact in Addressing Social Problems". This dissertation has been recorded and translated into several languages, including Indonesian edition. An excellent book addresses the question of charity konprehensif with a modern feel. For delay my doctorate, because he had to leave Egypt due to the cruel regime at that time. He was forced into Qatar in 1961 and there was established the Faculty of Islamic Law at Qatar University. At the same time, he also founded the Center for the Study of History and the Sunnah of the Prophet. It gets citizenship and making Doha Qatar as a place of residence. In addition, in 1957, Yusuf al-Qaradawi also finds time to enter the Institute of Arab Studies Discussion and Height by reaching high diploma Arabic language and literature. In the course of his life, Qaradawi unschooled in the "education" of the jail since his youth. When the Egyptian King Faruk held, he entered prison in 1949, when he was still 23 years old, because of his involvement in the Muslim Brotherhood movement. In April 1956, he was arrested again in June during the revolution in Egypt. In October he was back in jail for two years military. Qaradawi famous sermons-sermons that daring that was banned as a preacher at a mosque in the area Zamalik. The reason, sermons-sermons assessed create public opinion about the current regime's injustice. Qaradawi has seven children. Four daughters and three sons. As a scholar who is very open, he freed his children to study any match your interests and talents and tendencies of each. And incredibly, he did not distinguish education must be adopted daughters and sons. One of his daughters received his doctorate in the field of nuclear physics from the UK. His second daughter earned a doctorate in chemistry also from the UK, while the third is still taking S3. The fourth S1 has completed his education at the University of Texas USA. The boys were the first to take S3 in electrical engineering in the United States, the second study at Darul Ulum Egypt. While the youngest had completed his studies at the faculty of electrical engineering majors. Judging from the diversity of children's education, we can read the attitudes towards modern education Qaradawi. Of the seven children, only one study at Darul Ulum Egypt and studying religion. While the other, taking general education and everything taken abroad. The reason is, as Qaradawi is a scholar who reject the dichotomous division of science. All science can be un-Islamic and un-Islamic, depends on the people who see and use it. A dichotomous separation science, according to Qaradawi, has hindered the progress of Muslims. Yusuf Qaradawi is known as Islamic scholars and thinkers unique sekaligis special, unique and keistimewaanya was no other way or not he has a distinctive methodology in communicating the message of Islam, because the methodology that he readily accepted in the western world as a thinker who always show islam be friendly, polite, and moderate capacity that makes Qaradawi often attend international meetings of religious leaders in Europe and in America as a representative of the Islamic group. In the thinking and preaching Islam lanterns, gait Joseph Qardhowi vital position in contemporary Islamic movements, time spent in submissive to Islam, bercearamah, convey the actual problem and Islamic issues in different places and countries to make a simple figure of influence who had been imprisoned by the Egyptian government is very large in many parts of the world, particularly in the contemporary Islamic movement through his work that inspired the modern Islamic revival. 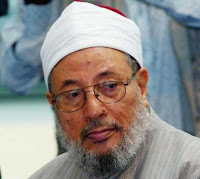 About 125 books that he has written in a variety of dimensions of Islam, there are at least 13 aspects category Qaradawi in his works, such as troubleshooting problems: fiqh and usul fiqh, Islamic economics, Ulum Al-Quran and As Sunnah, theology and philosophy, fiqh behavior, preaching and tarbiyah, movement and the rise of Islam, the unification of Islamic thought, the general knowledge of islam, islam serial prominent figures, literature and more. some of his work has been translated into many languages, including Indonesian, registered, at least 55 titles that Qaradawi has been translated into Indonesian. In addition to the core work as a teacher and preacher, he is also active in various social activities to help his brothers, the Muslims, in many parts of the world. Hasan al-Banna: "Verily, he was a gifted poet and topnotch" Samahatus Kabir Shaikh Imam Abdul Aziz bin Abdullah bin Bazz former mufti and chairman of the Saudi royal Hai'ah Kibarul Ulama said: "The books have a scientific weights and is very influential in the Islamic world." Imam Muhammad al Muhaddits Nashiruddin al Albany-leading 20 th century scholars of hadith says, "I asked (al Qaradhawy) to examine the history and tradition to explain the validity and dha'ifan hadith contained within the book (Halal wal Haram). Thing it shows he has a noble spirit and a good person. I know all directly. Every time he met me at a time, he would always ask me about the hadith or fiqh issues. He did that so he knows my opinion on the matter and he may benefit My opinion of them. was all show very high humility and courtesy and manners are matchless. May Allah bring benefits to its existence. " Mengapapa followers of the two sheikhs were not taking advantage of their testimony? Imam Abul Hasan an Nadwi - renowned scholars from India said: "al Qaradhawy is an 'alim very deep knowledge as well as world-class educators." Al 'Allamah Mustafa az Zarqa', Syrian jurist said: "al Qaradhawy is Hujjah this age and it is the favor of Allah upon the Muslims." Abdul Fattah Abu Al Muhaddits Ghuddah, hadith expert and prominent Syrian Muslim Brotherhood said: "al Qaradhawy is our murshid. He was a 'Allamah." Shaykh Qazi Hussein Ahmad, Amir Jamiat Islami Pakistan said: "Al Qaradhawy is scientific madrassa fiqhiyah and da'awiyah. Compulsory for the people to drink of the cool science." Shaykh Taha Jabir al Ulwani, director of the International Institute of Islamic Thought in the U.S. - said: "Al Qaradhawy is faqihnya dainya propagators and the faqih." Shaykh Muhammad alGhazaly-dai and the Egyptian cleric who had been a teacher at the same time al Qaradhawy Muslim Brotherhood figure said: "Al Qaradhawy is one of the Imam of the Muslims of this age are able to combine the mind with atsar fiqh." When asked again about al Qaradhawy, he replied, "I'm the teacher, but he ustadku. Shaikh was once a student of mine, but now it has become my teacher." Sheikh Abdullah bin Baih-lecturer Univ. Malik Abdul Aziz in Saudi - said: "Verily, Allama Dr. Yusuf al Qaradhawy is a person who no longer need to praise because he is an 'alim who has a breadth of knowledge is like the ocean. He was a powerful preacher. murabbi A generation of Muslims who are very topnotch and a reformer devoted to charity and words. he spread knowledge and wisdom because he is a figure of a professional educator. "